The CPHL project, funded in part by the National Science Foundation, is a collaborative effort involving linguistics, computer science, and statistics, aimed at various goals. Producing and maintaining real linguistic datasets, in particular of Indo-European languages. Formulating statistical models that capture the evolution of historical linguistic data. Designing simulation tools and accuracy measures for generating synthetic data for studying the performance of reconstruction methods. Developing and implementing statistically-based as well as combinatorial methods for reconstructing language phylogenies, including phylogenetic networks. An article appearing in the New York Times described the earlier work done in this project. Click here to read the article. NSF support for this project was provided through grants 0312911 and 0312830. Don Ringe, Department of Linguistics, The University of Pennsylvania. Tandy Warnow, Department of Computer Sciences, The University of Texas at Austin. Luay Nakhleh, Department of Computer Science, Rice University. Steven N. Evans, Department of Statistics, The University of California at Berkeley. 11 M. Bonet, C.A. Phillips, T. Warnow, and S. Yooseph, "Constructing evolutionary trees in the presence of polymorphic characters." SIAM J. Computing, 29(1):103-131. 12 D. Ringe, " Tocharian class II presents and subjunctives and the reconstruction of the Proto-Indo-European verb." Tocharian and Indo-European Studies 9:121-142, 2000. 13 D. Ringe, T. Warnow, and A. Taylor, "Computational cladistics and the position of Tocharian ." In: The Bronze Age and early Iron Age peoples of eastern Central Asia (1998, ed. Victor Mair; JIES Monograph 26), pp. 391-414. 14 T. Warnow, "Mathematical approaches to comparative linguistics." Proceedings of the National Academy of Sciences, Vol. 94, pp. 6585-6590, 1997. 15 T. Warnow, D. Ringe, and A. Taylor, "Reconstructing the evolutionary history of natural languages ." Proceedings of the ACM-SIAM Symposium on Discrete Algorithms, 1996, pp. 314-322. 16 T. Warnow, D. Ringe, and A. Taylor, "Reconstructing the evolutionary history of natural languages." IRCS Report 95-16. Philadelphia (1995): Institute for Research in Cognitive Science, University of Pennsylvania. Technical report, 18 pp. Linguists Don Ringe and Ann Taylor have produced two datasets of 24 languages, representing the 12 major subgroups of IE languages. The screened dataset is produced from the unscreened dataset by removing all characters that clearly exhibited parallel evolution and/or back-mutation (those two phenomena are usually referred to as "homoplasy"). Screened IE dataset. This dataset contains 22 phonological characters, 13 morphological characters, and 259 lexical characters (those counts include multiple encodings of several characters). Unscreened IE dataset. This dataset contains 22 phonological characters, 17 morphological characters, and 336 lexical characters (those counts include multiple encodings of several characters). 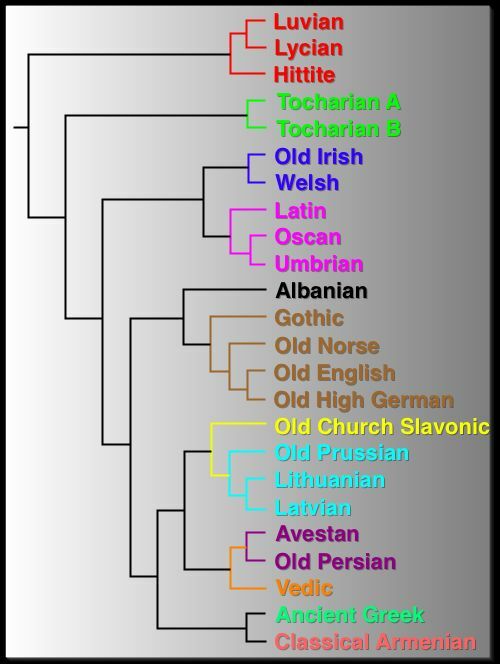 The Indo-European wordlists. The parallel wordlists of 24 Indo-European (IE) languages used in the Rige, Warnow, Taylor 2002 paper (PDF). Sequence evolution simulator: this tool simulates the evolution of a set of languages down a tree or a network, allowing the user to specify parameters such as: amount of change, times, rates of homoplasy and borrowing, etc. Compatibility scoring: this tool takes as input a tree/network leaf-labeled by a set of sequences, and computes the weighted/unweigted compatibility score of the tree/network. MIPPN: this tool solves the Minimum Increment to Perfect Phylogenetic Network (MIPPN) problem, described in the paper by Nakhleh, Ringe and Warnow (under review for LANGUAGE). In a nutshell, this program takes as input a tree leaf-labeled by a set of sequences, and adds a minimum number of contact edges to the tree (thus, possibly resulting in a network) to make all characters compatible. This was proposed and evaluated in the aforementioned paper as a heuristic for detecting borrowing events in a language dataset.